Each row in the Time and Sales window displays information about a single trade for a contract. 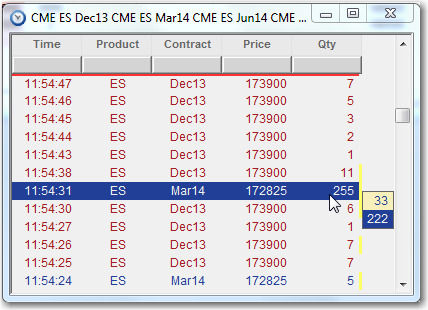 The row information is color-coded so you can easily identify the trade activity. These colors can be changed in the Color tab on the Properties menu. Note: Set the trade quantity you want to highlight on the Time and Sales tab on the Properties menu. When set to collect trade data for a specified interval, the Time and Sales window displays a yellow bar next to the accumulated quantity in the Qty column. The default color is yellow but can be changed using the Time and Sales Properties window or Time and Sales tab in Global Properties. To display the individual values that comprise an aggregate value, hover the cursor over the value next to the bar in the Qty column. To configure the accumulator interval, refer to Time and Sales in the Global Properties topic.